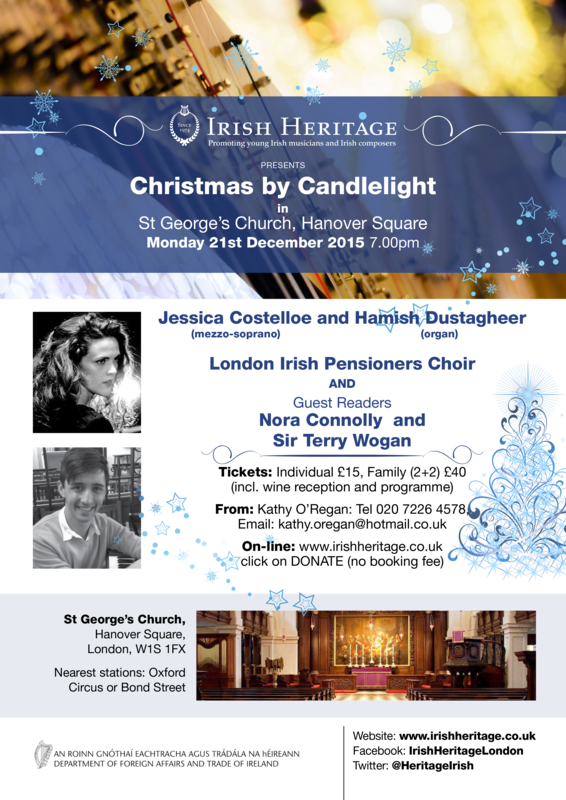 Our friends at Irish Heritage are producing a concert to celebrate Christmas at the beautiful Parish Church of St George, Hanover Square, Mayfair. Featuring the ILS’s own Nora Connolly as a reader alongside Sir Terry Wogan and music from Hamish Dustagheer (Organist), the London Irish Pensioners Choir and a Soprano (TBA), we expect it will prove a lovely evening. Irish Heritage promotes the appreciation and understanding of classical music and music composed by Irish composers performed by young Irish musicians in Britain to a wide audience. It is the only Irish arts organisation in Britain dedicated to helping young musicians through their continuing education and early part of their careers. Irish Heritage presents a programme of events throughout the year in established music venues open to the public, and supports the events of other organisations which share its aims in music and the arts. It has strong links with conservatoires in Ireland and Britain to identify the rising stars and help them on their way. The Irish Heritage Music Bursary, the links with the Royal Dublin Society and Conservatoires in Ireland are fulfilling Irish Heritage’s commitment to advancing educational opportunities for Ireland’s talented young musicians.